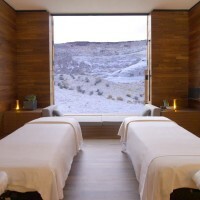 The Amangiri Resort and Spa, located on a 600+ acre site in southern Utah, is a collaboration between three architects: Marwan Al-Sayed, Wendell Burnette and Rick Joy. 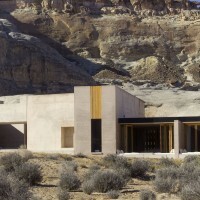 The three architects were inspired to work together on the awe-inspiring site, to create a bold yet responsive settlement that both honors and celebrates the magic and mystery of southern Utah’s majestic cliffs and rock formations. 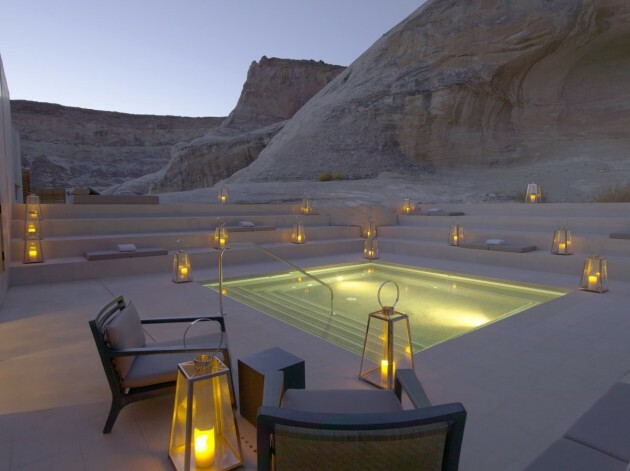 Amangiri is located on 243 hectares (600 acres) in Canyon Point, Southern Utah, close to the border with Arizona. 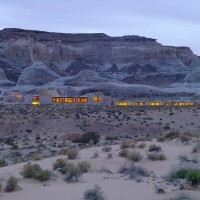 The resort is tucked into a protected valley with sweeping views over colourful, stratified rock towards the Grand Staircase – Escalante National Monument. 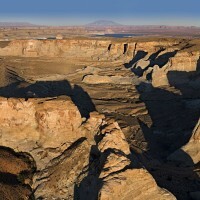 The resort is a 25-minute drive from the nearest town of Page, Arizona and a 15-minute drive to the shores of Lake Powell. 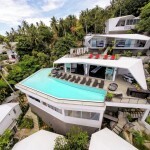 Architecturally, the resort has been designed to blend into the landscape with natural hues, materials and textures a feature of the design. 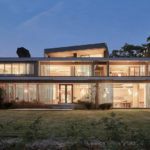 The structures are commanding and in proportion with the scale of the natural surroundings, yet provide an intimate setting from which to view and appreciate the landscape. 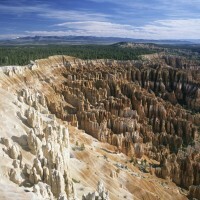 Arrival to the resort is via a winding road that descends into the valley and leads to the central Pavilion. 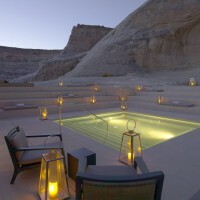 Built around the main swimming pool, the Pavilion embraces a dramatic stone escarpment. 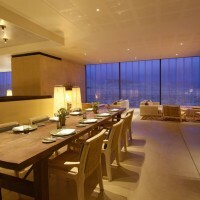 Within the Pavilion is the Living Room, Gallery, Library, Dining Room, Private Dining Room and Cellar. 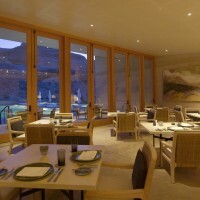 Two accommodation wings lead from the Pavilion into the desert: 17 suites are located within the North Wing and another 17 suites together with the Aman Spa are located within the South Wing. 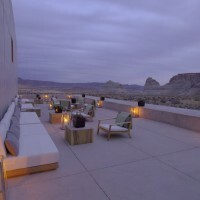 Outward views from the resort look over the untouched valley surrounded by lofty bluffs. 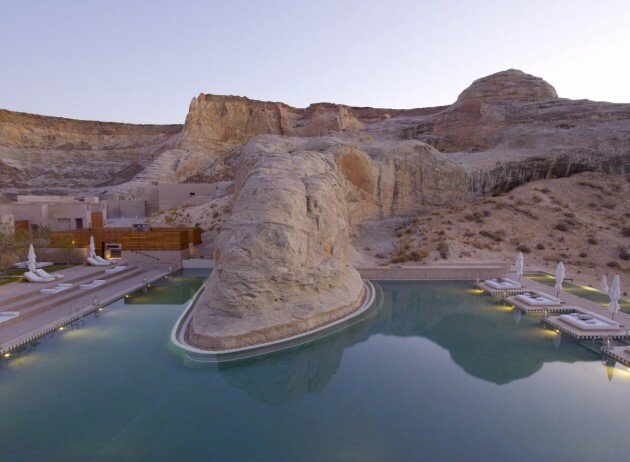 Amangiri offers 34 suites in total: 13 Desert View Suites, 14 Mesa View Suites, one Terrace Suite, two Pool Suites, two Terrace Pool Suites, the Girijaala Suite and the Amangiri Suite. Entry to each suite is via a private courtyard that features a Douglas Fir timber screen and includes a dining table, two chairs and a sculptured light form. A glass wall with a central door opens to a combined bedroom and living area which includes a writing desk and a king-sized bed. Beyond the bed is a sitting area which features a low-set sofa, a coffee table, reading chairs and a side table. A soaring timber cabinet separates the bedroom and living area from the dressing room, and houses a television and combined CD/DVD player. 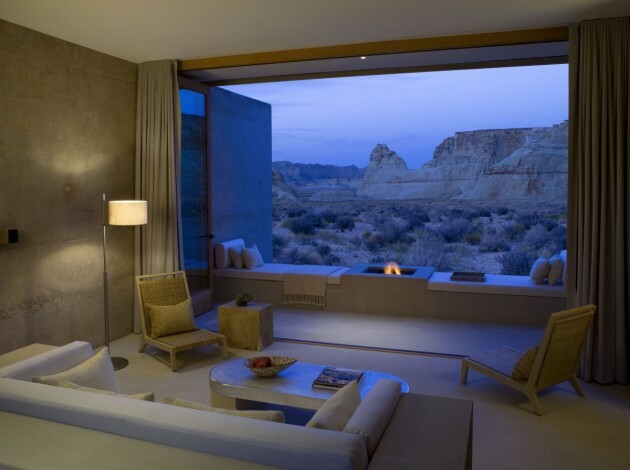 Concertina glass doors open from the sitting area to a spacious desert lounge that frames the view of the natural landscape beyond. The lounge contains a plinth with resting mattresses and a central fireplace. The adjacent sky-lit dressing room extends the full length of the suite and features an extensive wardrobe with a personal safe and spacious dressing area with twin vanities atop a stone plinth. To one end of the dressing room is a separate toilet room and to the other, a spacious bathroom lined with sage green tiles. 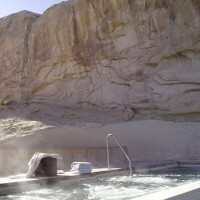 The bathroom features twin rain showers and a comfortable soaking tub with uninterrupted views of the landscape. 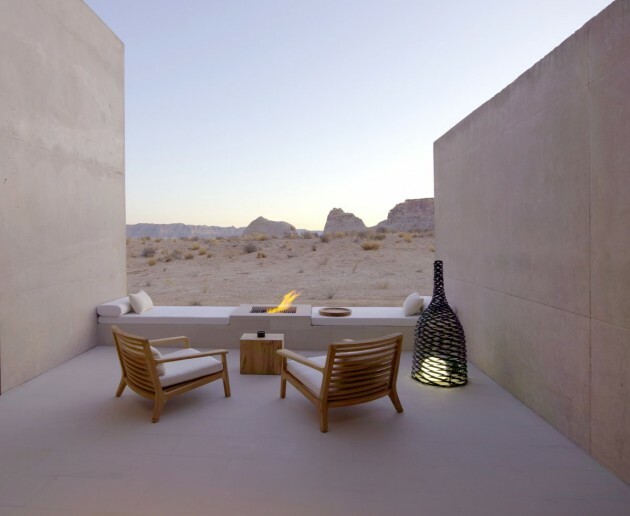 Design finishes include white stone floors and concrete walls that echo the natural stone of the surrounding land- scape. The furniture features rawhide, natural timbers and fittings in blackened steel, while light-coloured cushions and soft throws add warmth.